Saintes-Maries-de-la-Mer (lit. : Saint Marys of the Sea, Provençal Occitan: Lei Santei Marias de la Mar) is the capital of the Camargue (Provençal Occitan Camarga) in the south of France. It is a commune in the Bouches-du-Rhône department by the Mediterranean Sea. Its 2012 population was 2,495, though it can swell to 500,000 during the summer holidays. 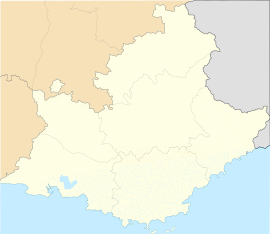 It covers the second-largest area of all communes in Metropolitan France, smaller only than that of neighbouring Arles. Ritual bath during the Romani pilgrimage of Saintes-Maries-de-la-Mer. The town is situated in the Rhône River delta, about 1 km east of the mouth of the Petit Rhône distributary. The commune comprises alluvial land and marshland, and includes the Étang de Vaccarès, a large lagoon. The main industry is tourism. Agriculture is also significant, and ranchers have raised horses and cattle unique to the Camargue; some of the bulls are used for bull-fighting and for the course camarguaise. There is bus service to Arles, 38 km away. The village was noted as "Ra" (see below) in the 4th century AD by the Roman geographer Rufus Festus Avienus. In the 6th century, the archbishopric of Arles was active and created a monastery or church in the town, named St. Mary, a favorite of the fishermen. The village became known as Notre-Dame-de-Ratis (Our Lady of the Boat - Râ being used in ratis, or boat) in reference to the three Marys arriving by boat. (Droit, 1963, 19). The name was later changed to Notre-Dame-de-la-Mer (Our Lady of the Sea, a synonym for the Virgin Mary). The current Church of the Saintes Maries de la Mer was built from the 9th to the 12th century, as a fortress and a refuge. It can be seen from 10 km away. It has a fresh water well inside, for when the villagers had to take shelter from raiders. In the 9th century, the town suffered raids from the Mediterranean Sea by the Vikings and later from the Saracens. In the 15th century, someone "discovered" the relics of Mary of Clopas and Mary Salome, who were said to have arrived there by sea (together with Mary Magdalene). The 500th anniversary of this event was celebrated in the 20th century by Pope John XXIII. In 1720, the town was spared by the plague. During the anti-clerical fervor of the French Revolution, the church was partially destroyed and the stones recycled. In 1838, the town was renamed Saintes-Maries-de-la-Mer, after the three Maries (Marys) of its Catholic and local history. Shortly afterward, the pilgrimage (see below) was instituted. A narrow-gauge railway line to Arles operated from 1892 until 1953. In 1888, Van Gogh made several paintings of the seascape and the town. In the early 20th century, the town was a literary and artistic center, with visits inter alios from such figures as American writer Ernest Hemingway and Spanish painter Picasso. The vicinity was used as a setting for various films. Since the second half of the 20th century, the population has increased. Retired people and holiday accommodation largely supplanted the fishermen and farmers, with a corresponding political shift to the right in elections. The three saints Mary Magdalene, Mary Salome and Mary of Clopas are believed to be the women who were the first witnesses to the empty tomb at the resurrection of Jesus. After the Crucifixion of Jesus, the Marys were said to set sail from Alexandria, Egypt with their uncle Joseph of Arimathea. According to a longstanding French legend, they either sailed to or were cast adrift - arriving off the coast of what is now France, at "a sort of fortress named Oppidum-Râ". The location became known as Nôtre-Dame-de-Ratis (Our Lady of the Boat - Râ being used in ratis, or boat) (Droit, 1963, 19). The name was later changed to Notre-Dame-de-la-Mer. In 1838, it was changed to Les Saintes-Maries-de-la-Mer. The town is also a pilgrimage destination for Roma (Gypsies), who gather yearly for a religious festival in honor of Saint Sarah. Dark-skinned Saint Sara is said to have possibly been the Egyptian servant of the three Marys. In another version, Sara was a local woman who welcomed the three Marys on their arrival. A statue of Ste. Sarah is in the crypt of the church, which also encloses a 4th-century BC taurobolic altar once dedicated to the cult of the Indo-Iranian god Mithra, although a likely Celtic origin is claimed. View of Saintes-Maries by Vincent van Gogh, 1888, Kröller-Müller Museum, Otterlo, Netherlands (F416). Arènes des Saintes Maries de la Mer is a prominent bullfighting ring, staging festivals throughout the summer. The windsurfing Canal where the last three world sailing speed records were set is on the outskirts of the town. Vincent van Gogh painted several paintings here, including Street in Saintes-Maries in 1888. Hermann-Paul died here in 1940, two days before the French capitulation to Germany in the Battle of France. Tori Amos wrote a song, "Marys of the Sea", inspired by Saintes-Maries-de-la-Mer, most notably Mary Magdalene. Mick Softley wrote a song called "Just Flew In On A Jet Plane," featured on his Sunrise/Streetsinger album, in which he refers to flying "from Montpelier, from the festival of gypsies, at Les Saintes-Maries-de-la-Mer, and in a church in the village, 1000 candles glow, for Magdalene of the sea, from 2000 years ago". Bob Dylan claimed to have composed the song "One more cup of coffee," included on his album Desire, while visiting the Roma festival in 1975 on his 34th birthday. ^ Wineyard, Val. 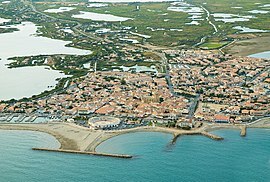 "Saintes Maries de la Mer". I Write about Mary Magdalene. Retrieved Jan 13, 2015. ^ "Arènes de Saintes Maries de la Mer : organisation de sepectacle". www.arenesdessaintesmariesdelamer.com (in French). Retrieved 14 October 2018. ^ "Biou and Toros Feria, Camargue". www.saintesmaries.com. Office de Tourisme des Saintes-Maries de la Mer. Retrieved 14 October 2018. ^ Droit, Michel. (1963). Carmague. Ernest and Adair Heimann (trans.). London: George Allen and Unwin. ^ Letter, BJorner website. Note: At a concert (Alameda County Coliseum, Oakland, California, 13 November 1978), he introduced the song thus: "Thank you. I once went to the South of France on my birthday to a festival of gypsies down there. They had come from all over the world. Anyway, I got mixed up with someone and wrote this song." Wikimedia Commons has media related to Saintes-Maries-de-la-Mer.